We’ve been to space for Alien: Covenant and set sail on the high seas for Pirates Of The Caribbean: Salazar’s Revenge, which can only mean blockbuster season is upon us. Diana (Gadot), princess of the Amazons, lives on an all-female, protected island with her mother, Queen Hippolyta (Nielsen) and aunt Antiope (Wright). When a war pilot (Pine) breaks through the barrier, she decides to help him on his mission, and in doing so hopes to find Ares, the war god, who banished her and her kind. It’s about time Wonder Woman was given her own origin story treatment. Directed by Patty Jenkins, there’s a lot of excitement following Gadot’s scene-stealing debut in Batman v Superman: Dawn Of Justice and it looks as if the film will be a spectacle, combining the wonder of Greek mythology with the grittiness of World War I.
Dr Henry Jekyll (Crowe) is a man struggling to contain his inner demons, and in this telling, The Prodigum, an underground crypt where mystical creatures are stored. All hell breaks loose when an ancient princess (Boutella) is awakened leaving antiques thief Nick Morton (Cruise) with some explaining to do. Promising stellar stars, freaky monsters, the first female Mummy and never-seen-before stunts, let’s hope the film lives up to the hype as the movie’s intended to kick-start a franchise focusing on the Universal Monsters, including Frankenstein’s Monster, The Invisible Man and The Creature From The Black Lagoon. Following on from 2014’s Age Of Extinction, and with Optimus Prime gone, humans and Transformers are at war. The key to saving mankind’s future is finding out why the Transformers keep returning to Earth. Cue Anthony Hopkins as a man who might just have the answers. Director Michael Bay has announced this is his final outing in the franchise, so you imagine he’ll want to leave with a big, big bang. Henry (Lieberher) is a gifted 11-year-old who takes care of his single mum Susan (Watts) and his younger brother Peter (Tremblay). When it turns out his classmate crush and next-door neighbour Christina (Ziegler) is hiding a dark secret, Henry devises a plan which sees the whole family helping out. Most of this cast might be young but they’re a talented bunch (you’ll recognise Tremblay from Room and Ziegler as the dancer in Sia’s music videos). The film’s also directed by Colin Trevorrow, who’s co-written the script for the Jurassic World sequel, and will be at the helm of Star Wars: Episode IX. Gru’s dragged back to his villainous ways when he meets his flamboyant – and hirsute – twin brother Dru (both voiced by Carell) who persuades him to undertake “just one heist” to keep up the old family tradition. Seven years after the original was released, Gru and his motley crew of minions are still going strong with spin-offs, theme park rides and animated shorts. And it’s no wonder, with whip-sharp writing and slapstick gags. One for the whole family to enjoy. When Scott Johansen (Ferrell) and his wife Kate (Poehler) discover they’ve blown their daughter’s college fund, they decide to claw the money back by opening up an underground casino in the basement of their house. Ferrell isn’t venturing into new territory with this comedy, but when he plays gormless so well, he doesn’t have to do a lot to raise the laughs (look out for the sunglasses scene in the trailer). He and Poehler make a great double act as a suburban couple attempting to become more street. Peter Parker (Holland) is coming to terms with his web-slinging powers, but even with Tony Stark/Iron Man (Downey Jr.) as a mentor, balancing school with saving the world is tough, especially when there’s a serious villain (Keaton) to battle. The pressure’s on to bring something fresh, after all, this is the sixth Spider-Man movie in 15 years, and the second reboot (following Tobey Maguire and Andrew Garfield’s turns). But if Holland and Downey Jr’s winning interaction in Captain America: Civil War is anything to go by, fans are in for a treat. Following on from the events in Dawn Of The Planet Of The Apes, the primates and humans are at war with each other. When the apes suffer huge losses, Caesar (Serkis) takes it upon himself to avenge their deaths and hones in on the callous Colonel (Harrelson). Word is this movie marks the end of Caesar’s journey, so fans will want to see how things pan out for the conflicted ape – and for the humans pushed to the verge of extinction. 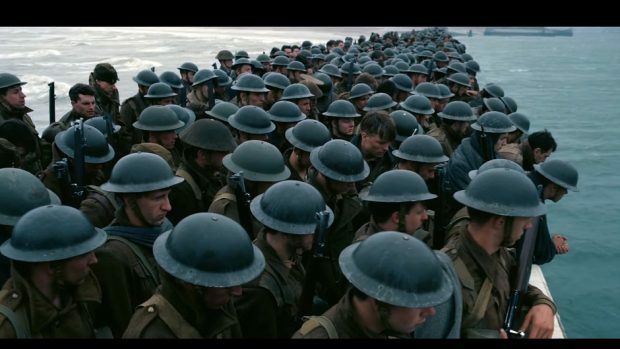 The events of Dunkirk are relived in this World War II drama, which depicts what happened when Allied forces, surrounded by Nazi troops, were evacuated from the French harbour. Christopher Nolan, the man responsible for Insomnia, Interstellar and The Dark Knight franchise, is helming this gargantuan war movie, so no expense will have been spared to bring the full horrors of war to the big screen. A group of old college friends get together and head to Miami for a hen party, but things take an unexpected turn when their male stripper ends up dead. It’s six years since Bridesmaids was released, so it feels like a bachelorette-themed comedy is overdue. Just this time the laughs are a little darker given there’s death in their midst.